International girls, rejoice! I've got a non-US, non-UK polish line to share today. This one hails from Brazil. Have you ever heard of or tried Mundial-Impala polish? The line uses itty bitty little bowling pin shaped bottles and offers a wide variety of finishes. Glitter, shimmer, holographic polishes, cremes, the whole shebang. I'm showing a variety of them today for you. The colors are a little sheer, which tends to be difficult to work with. They do self-level nicely, but the thin formula requires extra coats. 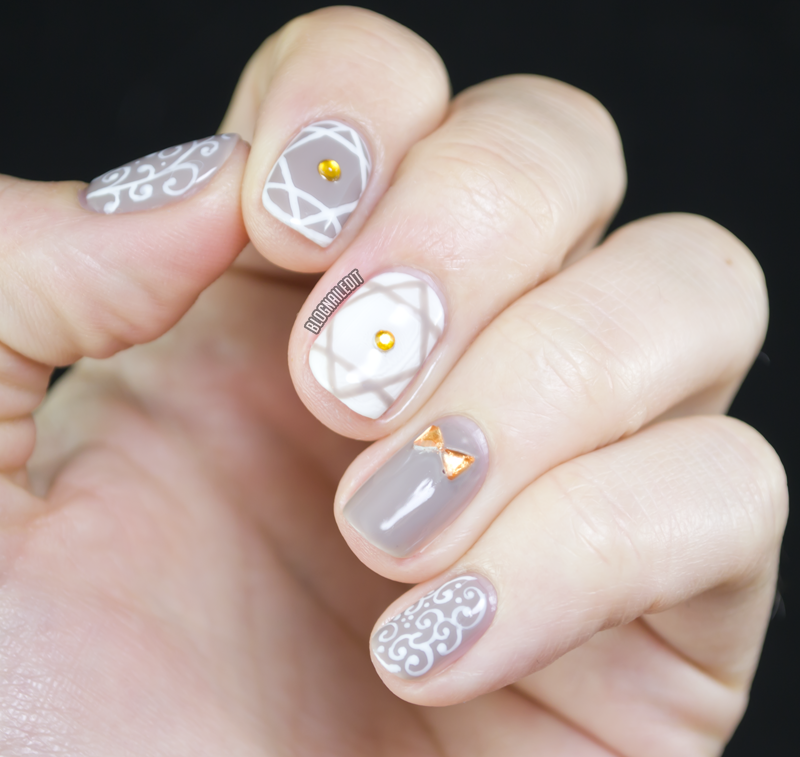 Check out the nail art I did with them (and some of the rhinestones they sent along for review)! I was inspired by two nail artists I follow on Instagram, @chinailbar and @lucinhabarteli, who is actually a Brazilian herself! Let's look at the swatches. This color is called água viva. I'm showing 3 coats. It's a light, cool sheer neutral grey with pink iridescent shimmer. This holographic polish is ame muito (3 coats). amor de verão is a Barbie pink satin shade (3 coats). It's slightly iridescent as well. biquini vermelho (2 coats) is a bright, cherry red creme. branco (3 coats) is one of the colors I used in my nail art above. It's your basic, stark white creme. A little streaky as most are, but I liked it when it comes to whites! The other shade I used in the nail art is crochê (3 coats). This is a warm grey, and I like it a lot once it's built up. dance mais (3 coats) is the second holographic in this review. It's a slate blue-purple holographic. Again, very sheer. This is disco ball (one coat shown over branco). Can't go wrong with a holographic glitter! I love the little accent glitter pieces scattered throughout. na mira 3D (3 coats) is fantastic! What a great holographic shade. It's very bold and uber-sparkly! This might be my favorite in this bunch! palmeira tropical (3 coats) is a fantastic creme jade! Unfortunately, it's a little sheer, but it applies well (just like the rest) and evens out well into a beautiful color. I want to see this one as the base for a stone mani! I think you can get these from the Mundial website, but I'm not entirely sure of that. You can definitely get them from Amazon though, even to the US. These products were sent to me by YaYa Publicity & Mundial-Impala. The reviews are based entirely on my experience with the products and were in no way influenced by anyone. I don't know about their polishes, but their lipliners are the best EVER, and it seems that the rest of the line is on the same level.